A single, attractive sheet can be just the help a student needs to motivate them to a new level of performance. 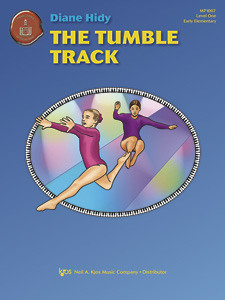 Tumble Track, Backstage Pass and The Bridge to Forever are in the National Federation of Music Clubs Bulletin for 2011/2012/2013. This Late Elementary piece sounds much harder than it is. It's a great piece for a student who wants a Rock and Roll kind of sound. I even had a 10-year-old girl play it with her rock band! 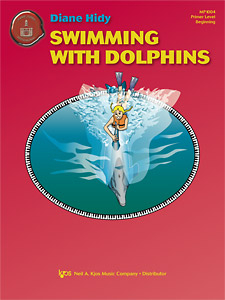 Kids love the idea of dolphins, and the thought of swimming with them fascinates them. This charming original melody in middle C position is ideal for any beginning student, includes lyrics and an optional teacher duet. I like the dolphin the best. 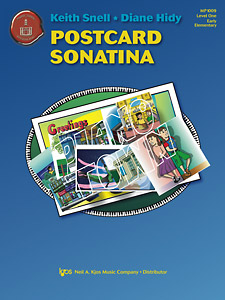 This simple sonatina is in Middle C position in the key of F Major. It has a "big piece" feel. This cheerful middle C position piece was written for a student who loved to read. It includes brief mirrored hands together passages. Perfect for a first recital. For my nose down in a book. I'd read night and day. This was written for my student, Catia, who was in need of a piece that sounded showy and exciting to play for the Halloween recital. It can be read or taught by rote. It ends with a dramatic glissando that disappears into the mist - just like the vanishing villain in a comic book. In C minor, written without key signature to make the note reading easier. One of the first Attention Grabber pieces - before those books existed! Has no words at all. I wrote this tender piece as a gift for my student, David, whose father had passed away exactly a year before. He was only 8 years old when I wrote this for him. I wanted to give him a way to express deep emotions. Cheery and just plain fun, this elementary solo alternates between middle C position and C 5-finger position. Full of catchy slurs and staccatos well-supported by the optional accompaniment. This is one of the first pieces I wrote for a child with ADD. Every child I've ever taught it to has loved it and somehow I never tire of teaching it. Typical is just not me. I will do extraordinary things.